WW2 HQ Ships and HQ Assault ships shared the task of implementing the detailed plans for large scale amphibious landings onto unimproved beaches in enemy occupied territory. They achieved this through a complex communications network that allowed them to monitor the progress of the battle against the plan and to direct the coordinated operations of the Army, Navy and Air Force in the light of fast moving events. They were floating, effectively, Command and Control Centres with the capacity to communicate with aircraft, ships, shore establishments and units operating in the battlegrounds. Philip Zieglar wrote in Mountbatten's official biography, "One of the more valuable gifts, which Mountbatten endowed on Combined Operations, was the HQ Ship. It may seem obvious today that a massive and complex amphibious operation needs to be controlled from a vessel, which remains offshore after the landing, which is not liable to be removed to take part in some naval operation and into which all the communications from land, sea and air are channelled." Mountbatten certainly claimed to have discussed the idea with his, then Assistant, Fleet Wireless Operator, Michael Hodges in the 1930s but it was not until the ill fated attack on Dakar in 1940, that the need for an independent floating command, control and communications centre was fully understood. General Irwin wrote, "Seldom have I felt so impotent, as during this expedition, when I was separated from my forces and tied to any naval operations which might become necessary. The Commander of any such enterprise must retain his independence from the fleet." In any event, the idea of HQ ships was taken up by Combined Operations HQ (COHQ). Mountbatten cajoled the Ministry of War Transport into supplying a vessel to develop the concept. HMS Bulolo, a former Australian Passenger ship of 6,400 tons, was stripped of non essential equipment and refitted with communications equipment and control room facilities. 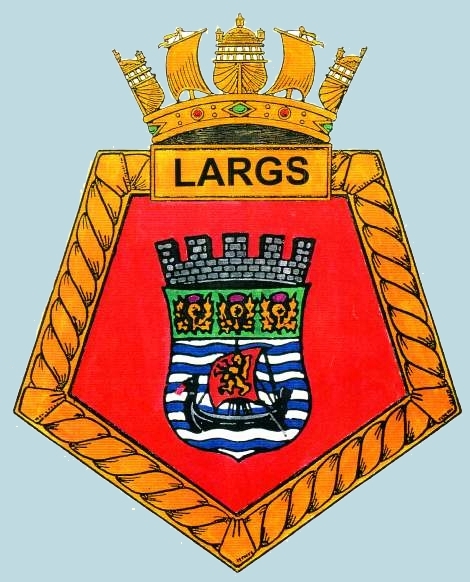 The work was completed in the summer of 1942, by which time the conversion of a second HQ ship, HMS Largs, was underway. HMS Bulolo - an account by Edward (Ted) Pierce, who served on the Bulolo. I joined the Royal Navy in November 1941 and was drafted to HMS Glendower, a shore based training establishment at Butlins Holiday Camp, Pwllheli, where I learned basic seamanship. A few weeks later, I attended HMS Valkyrie in Douglas, Isle of Man for training in naval Radio Direction Finding (RDF), an early form of Radar. After six weeks training, I had become an Able Seaman, RDF. I was drafted to HMS Bulolo in the Royal Albert Dock, London, where it was undergoing conversion from an armed merchant cruiser to the first ever Combined Operations HQ ship. Admiral Mountbatten, who had been appointed to head up the Combined Operations Command in October 1941, had been instrumental in championing the role of HQ ships in amphibious warfare and I was to take part in the early use of seaborne Radar. By June 1942, Bulolo was engaged in sea trials off the coast of Scotland, during which Mountbatten came aboard to learn of progress first hand. Before long, signals personnel from Army and RAF units joined the ship’s company together with additional Naval officers and ratings. The RDF ratings were responsible to a Canadian 'green-stripe' sub-lieutenant and a leading seaman RDF by the name of Tom O’Carroll. He had served on a Flower Class corvette, where he had earned a DSM for detecting a U-Boat, which lead to its sinking. Our first operation as an HQ ship was the invasion of North Africa, codenamed Operation Torch. The convoy comprising 300 ships departed various UK ports around the end of October 1942, sailing under the flag of Admiral Sir Harold Burrough in Bulolo and destined for Oran and Algiers. Also on board were high ranking officers from all three services, British and American, including Generals Ryder and Mark Clark. The voyage was uneventful but, after passing undetected through the Straits of Gibraltar, we came under attack from enemy aircraft. Nevertheless, successful landings were made and in due time Bulolo proceeded with imperial dignity into Algiers harbour. Unfortunately, as Commander Anthony Kimmins reported in his BBC broadcast that night, all did not go well, "while approaching the harbour that morning, Bulolo had been heavily dive-bombed by Hun aircraft. A near miss had rendered the telegraph indicators, linking the bridge to the engine room, out of action. As there had been no occasion to use the telegraph between then and coming into harbour, there was no reason to suspect they had been damaged. Now, as the captain rang down ‘Stop - Half astern - Full astern’ the engineers below were blissfully unaware that they had been given any orders. Luckily a sandbank and some rafts broke the impact but Bulolo hit the concrete jetty a tremendous crack before finally coming to rest." Having visited Algiers a couple of times since then, I can testify that the dent in the jetty wall was still there! During the following days, Bulolo was the centre of activity for the initial political and military negotiations with the Vichy French authorities (Darlan, Giraud, etc) and it provided the vital communications link with the American forces in Casablanca. After four weeks alongside in Algiers, we returned to the UK in time for Christmas leave. But Bulolo's North African duty was not quite over. The Casablanca conference was scheduled for early January 1943, when Churchill and Roosevelt were to discuss plans for the next stage in the war. Churchill suspected Roosevelt and his advisers would be loathe to accept his (Churchill's) wish to continue with the Mediterranean campaign. They viewed it as an unnecessary diversion that would delay the main invasion of Europe. Here I quote from an account of these events by Rick Atkinson in his book An Army at Dawn. ‘ To help build his case, Churchill had ordered Bulolo to attend at Casablanca. With its war room full of planning studies bound in red leather dispatch folders, Bulolo symbolised the British empire’s formidable bureaucratic firepower’. Here, the British chiefs would lobby their American counterparts, all issues would be discussed fully and the relentless British logic would win through. Those red leather folders would reveal ‘wondrously precise studies and statistics’ in support of Churchill’s strategic arguments! Bulolo’s intellectual contribution to history seemed secure! By the time of the ill-fated Dieppe Raid on 19 August, 1942, the idea of HQ ships had taken hold. For this operation, three Hunt Class Destroyers were designated HQ Ships. HMS Calpe was the main HQ ship, from which Canadian, Major General, H F Roberts, MC, commanded the assault force and Captain J Hughes-Hallott, RN, commanded the naval element. Also on board was WW1 veteran airman, Air Commodore Adrian Trevor Cole, CBE, MC, DFC, of the Royal Australian Air Force. He controlled the air operations above the raid from a forward vantage point. Suitably qualified service personnel drawn from the three services manned the various communications and control room functions. HMS Berkeley was crewed to operate in support of HMS Calpe. It controlled low fighter cover squadrons under Acting Squadron Leader, James Humphrey Scott, RAFVR. Berkeley was also designated "First Rescue Ship". HMS Fernie was the reserve HQ ship if either of the other two became disabled. Prior to her departure for Dieppe, her battle cry was played over her loud hailer, the sound of which echoed across the harbour waters to the embarking troops on the jetties. Operation Jubilee commenced in the late evening of 18 August, 1942. The flotilla comprised over 230 ships assembled from ports along the south coast of England. It was a warm, moonless night as the ships headed across the channel to Dieppe. Radar stations on the English coast picked up "unidentified vessels" and twice, at 01.30 and again at 02.30 on 19 August, they radioed warnings to the naval commander, Captain Hughes-Hallet. These warnings were not acknowledged and the raiding force took no evasive action. The force commanders were, therefore, unaware they were on a collision course with a German convoy proceeding from Boulogne to Dieppe. The main assault troops were carried in large ships with their LCPs (Landing Craft Personnel) hanging from davits. Most of the commandos made the crossing in their own LCPs, each of which held about 20 men, while the tanks were carried in their own LCTs (Landing Craft Tanks) with 3 tanks to each LCT. Just after 03.00, the first shots of Operation Jubilee were fired as troops, in the larger ships, were loaded into their LCPs and lowered into the water for the long run in to the beaches. The "point of no return" had been reached. As the action proceeded, Flt/Lt Kidd noted that the Berkeley was hit at 12.45 and began to sink immediately. HMS Calpe and some smaller craft transferred most of the crew and service personnel from the vessel and picked up others from the sea. The Berkeley's Captain, Lt J J S Yorke, RN, and most of his men, survived. Shortly after 13.00, HMS Albrighton torpedoed the Berkeley and she sank at 13.08. HMS Calpe was attacked and bombed by 3 Dorniers, which approached from the west at 8,000 ft. They released their bombs at 6,000 ft while Calpe was undertaking a slow manoeuvre, searching for a downed pilot. Although there were no direct hits, the blasts damaged the ship's stern, causing some fatalities and blowing six more overboard. They were rescued by SGB 9, a gunboat under the command of Lt Peter Scott DSC, who was later to become a famed naturalist. Immediately afterwards, a Folke Wulf 190 approached from the east and strafed the starboard side of the destroyer, hitting the bridge with cannon fire, killing an Oerlikon gunner and wounding Air Commodore Cole. He was not the only Air Force casualty that day aboard the Calpe and the Berkeley. On the latter, Wing Commander, Stanley Skinner, DFC, Observer for the raid, was killed. He was a former night-fighter pilot with 604 Squadron. His American counterpart, Col LB Hillslinger, lost a foot in the action. 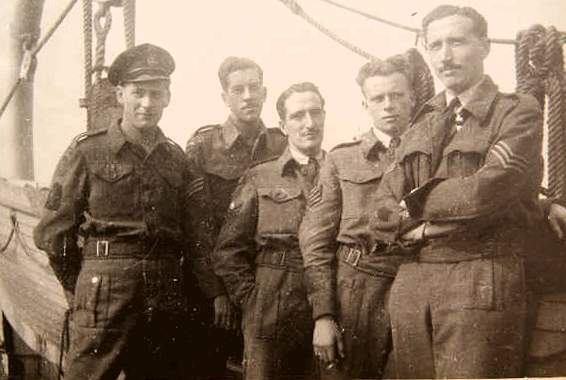 A few days after the raid, Flt Lt, Gerald Le Blount Kidd, RAFVR, Close Support Controller aboard HMS Calpe, reported "Communications worked excellently throughout and great credit is due to Flight Lieutenant Hall for his work in this connection. He also rendered invaluable assistance throughout the day as liaison officer between Air Commodore Cole and me and in other capacities. However, no signals were received by me from Uxbridge, so that it was not known what targets had been accepted and what squadrons were on their way. The view the Controller had from the bridge was excellent and invaluable in exercising control over aircraft. HQ ships I and 2 were often a good distance apart. As there were no fighters under the direct control of HQ 1, interceptions could not be made in several instances. Difficulty was experienced in locating the fighters actually under ship control. It was noted that aircraft in loose pairs and fours had a much better chance of making interceptions than aircraft in Squadron formation. (This was seen only once). Fighters rarely, if ever, saw enemy aircraft before they were warned by the Controller. Too often they were down sun of the convoy and too low and the attacks would be made from up sun and above. Fighters were often too low and got fired at by the convoy gunners, who were naturally very light on the trigger. There was a lot of RT chatter between aircraft. As things turned out, this did not matter but, if closer control of close support squadrons, or control of fighters, had been required, intercom would have to be cut to a minimum. Close support at Dieppe had little apparent effect on the houses, which were evidently reinforced. My aircraft recognition was very weak indeed but it was essential that controllers doing this type of work should be adept. It was observed that enemy aircraft were often chased home by large numbers of our fighters, many of whom could have had very little hope of catching up. Cover over the convoy was left very thin on these occasions. Excellent co-operation and assistance was, at all times, received from Squadron Leader Sprott on HQ 2. Apart from the fact that, owing to the unforeseen strength and preparedness of enemy resistance, the objectives were not gained and casualties were high. 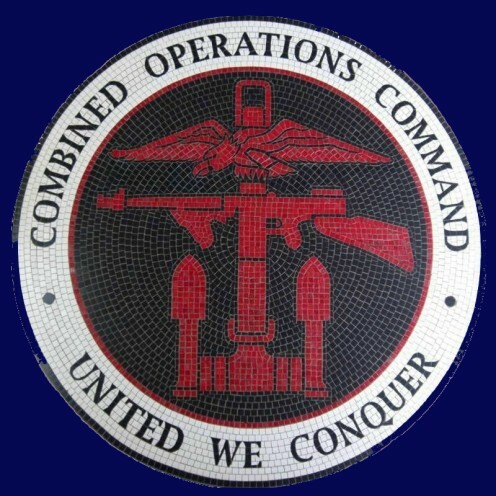 Nevertheless, viewed as a Combined Operation, the raid was a success of timing and close co-operation between the services. The next combined attack will have a much better chance of success as a result of the great deal of experience gained by all who took part. Much gratitude is felt for the pilots who looked after the convoy with such tireless resolve, from the moment of first light until after the weather had closed down and for the organisation and pre-planning that made that possible. 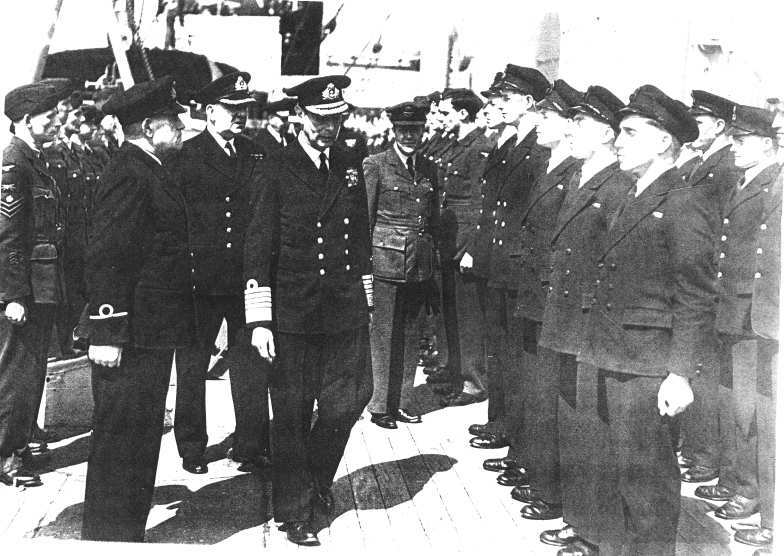 The Navy's efficiency and courtesy was much appreciated and the calm and cheerful courage of the Canadian Officers and men was an inspiration." Air Commodore Adrian Cole, Controller on HMS Calpe until wounded, was awarded the DSO. Acting Sqd Ldr, Gerald le Blount Kidd, on HMS Calpe, was awarded the MBE. 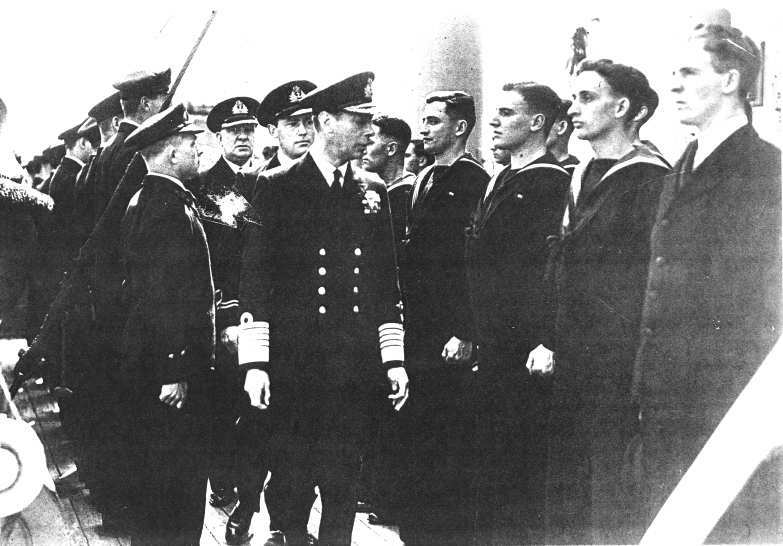 Sqd Ldr, James Humphrey Sprott, on HMS Berkeley, was awarded the OBE. 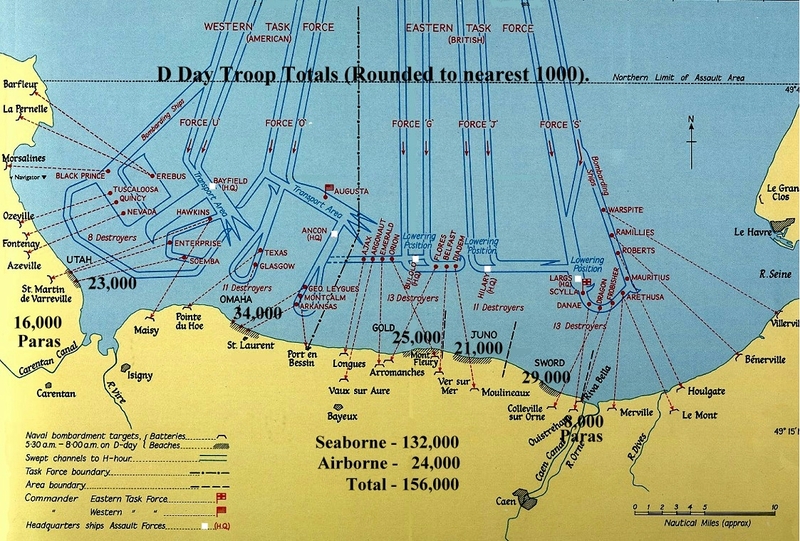 The amphibious part of Operation Overlord was code named Operation Neptune. The organisational chart below puts the complex command structure into context with references to the many different forces involved. Force K Force G Rear Admiral Frederick Dalrymple-Hamilton Cruiser HMS Belfast. Force A Force U Rear Admiral Morton L Deyo, USN Cruiser USS Tuscaloosa. Force O Rear Admiral Carelton F Bryant USN Battleship USS Texas. 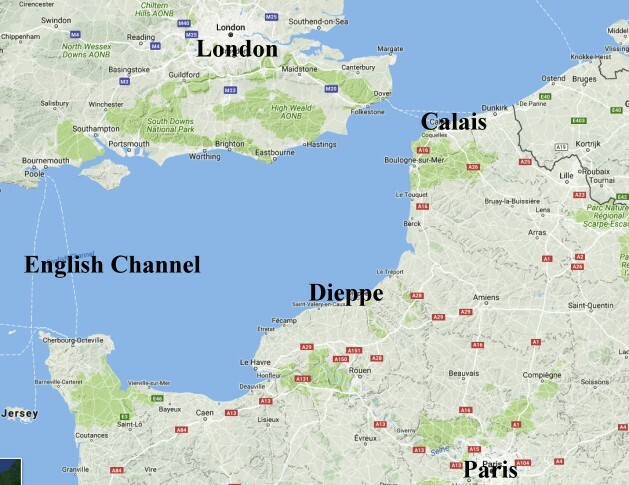 The positions of the 5 main HQ Ships (one for each landing beach) are marked on the D-Day map above. For the Normandy landings there were 3 main categories of HQ ships, each with a range of tasks appropriate to their function and status. The HQ Ships were concerned with monitoring progress of the invasion against the overall plan and directing changes in the light of the battle progress; the Assault HQ Ships were concerned with providing support over a local area and were in radio contact with the troops ashore and the Non Assault HQ Ships were allocated "stationery" tasks such as accommodation, repairs, engineering and depot. The latter acted as mobile or fixed bases for other ships, landing craft, submarines or small craft or in support of a naval base. They were either specifically designed for their purpose or converted from another use and were especially useful as bases for submarines, fast attack craft or small minesweepers, which had little space for the crew to relax. In the Eastern Task Force, one HQ Ship was assigned to each of the three Assault Divisions. The ships were positioned seaward of the beaches as follows: off Gold beach was HMS Bulolo with Naval Assault Force G carrying the Divisional Commander of the 50th Northumbrian Division; off Juno beach was HMS Hilary with Naval Assault Force J carrying the Divisional Commander of the 3rd Canadian Infantry Division and off Sword beach was HMS Largs with Naval Assault Force S carrying the Divisional Commander of the 3rd British Infantry Division. There were 3 Standby HQ ships; HMS Albrighton, HMS Royal Ulsterman and HMS Dacres. to accommodate the (RAF) Air Staff Officer representing the Commander of the Advanced Allied Expeditionary Air Force (Advanced AEAF) based at Hillingdon House, Uxbridge. representing to the Naval Commander any special requirements of the Air/Sea Rescue Services from naval vessels. The pilots also reported back to the HQ ship on the result of their mission for the benefit of the Military Commander on board. The HQ ships continued to act as forward control for support aircraft until a fully operational Group Control Centre had been established in the territory previously held by the enemy. The three HQ ships continued to operate off the beachhead for a number of days after D+7, by which time the Air Staff contingent had left as the front line moved inland. Thereafter the ships' functions were mainly Naval in nature. The delivery of this formidable list of tasks was challenging and required many different organisations, a large range of sophisticated high tech equipment, well trained personnel and a communications network second to none. 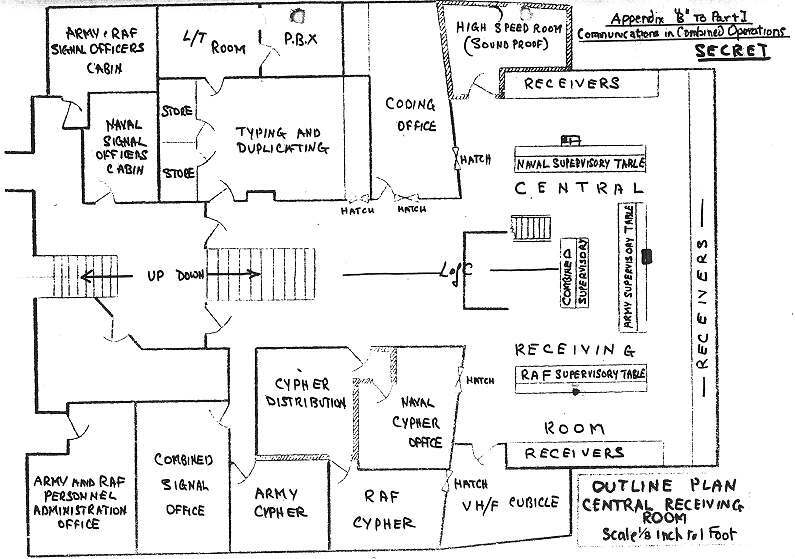 The organisation and technical equipment available to the invading force included; the Combined Control Centre at Uxbridge, which came under the overall direction of the Commander, Advanced AEAF (see below) under the Air Officer Commanding No 11 Group, in full collaboration with the Commanding General US IX Fighter Command and with representation of the US VIII Fighter Command. The Uxbridge centre was manned by both British and US personnel and was situated in the Operations Room of No. 11 Group, Air Defence of Great Britain, with all the facilities of this organisation available to them, augmented during the assault phase by additional communications to US Fighter Units and Fighter Direction Tenders at sea. 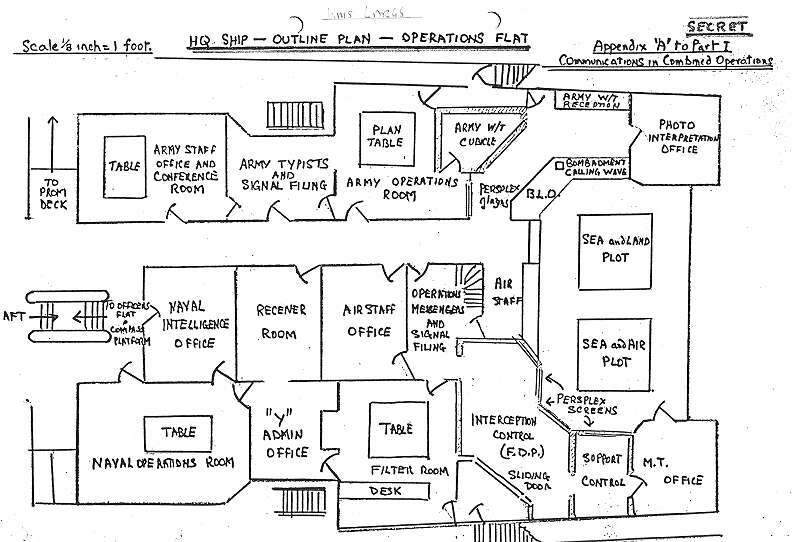 The Control Centre planned, coordinated and controlled all fighter operations and was, in addition, responsible for issuing executive instructions for Fighter/Bomber operations. Allied Expeditionary Air Force (ASAF) or Allied Armies' Expeditionary Air Force (AAEAF). As the name suggests, this was a special organisation to coordinate Allied air activity over the invasion fleet, landing beaches and battle grounds. The aim was to achieve the best use of the Allied Air Forces during the invasion. To achieve this, the AEAF was established at Hillingdon House, Uxbridge. It was under the general direction of the Commander-in-Chief, with the Commander AEAF directing and co-ordinating operations of the Ninth US Army Air Force and the RAF Second Tactical Air Force. However, it failed to be the controlling HQ for all Allied air forces, since RAF Bomber Command and the US Eighth Air Force were retained by their national command authorities. For a time, it was brought under the control of the Supreme Headquarters Allied Expeditionary Force (SHAEF) but later disbanded when Leigh Mallory was reassigned to the far east. Type 15 GCI Radar. The normal mobile GCI station operating on the 200 megahertz band was very vulnerable to enemy radio jamming by 'window' (see below) but it was still the best instrument for the control of night fighters when jamming was not present. Type 11 Station. This radar operated between 500 & 600 Megahertz and could be changed within the frequency range in 5 to 10 minutes. This made it less vulnerable to enemy jamming and its narrower beam width gave it better discrimination when the enemy dropped 'window'. Because its performance was inferior to Type 15, it was mainly used as a standby radar. Window. The effectiveness of radar could be seriously compromised by saturating the sky with metallised paper strips cut to half the length of the target radar frequency. They produce spurious echoes on radar screens, making it extremely difficult to interpret the data and identify the approach of aircraft. Army Signals Support Unit (ASSU). This was the radio channel provided for HQ Ships to pass calls from troop commanders on the far (enemy) shore to the UK when they required air support. It was an Army responsibility. Talk Between Ships (TBS). Operating between 65 and 85 Megahertz, this naval VHF/RT point to point equipment was used for communications between the HQ ships, FDTs and the Combined Control Centre at Uxbridge. Group Control Unit. A mobile unit of 4 vehicles which, when set up, formed a square around an operations table to control fighter aircraft in support of ground forces. The unit received plot information from mobile radar equipment, which was relayed to plotters at the table by W/T. There were also facilities within the unit for planning, intelligence gathering, Army Liaison and Movement Liaison. Plan Position Indicator (PPI). The PPI was a cathode ray tube, which gave indications in azimuth through 360 degrees and varying range scales. 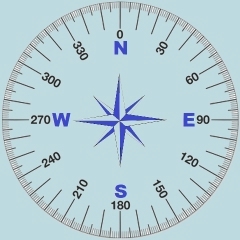 Azimuth (navigation) was the angular distance usually measured clockwise from the north point to the intersection with the horizon of the vertical circle passing through a celestial body. Radio Counter Measures were designed to decrease the effectiveness of the enemy's radio communications by jamming their frequencies. Movement Liaison provided information on the movement of friendly aircraft, to allow operation and filter rooms to correctly identify the tracks of friendly aircraft, to prevent unnecessary air raid warnings and to prevent friendly fire incidents. Air Signal Intelligence ("Y" Service) intercepted enemy R/T and W/T signals to make operational use of the information. In the case of seaborne landings, the small units in the FDTs intercepted R/T used by fighters, fighter/bombers and occasionally bombers. The information was immediately made available to Fighter Controllers in plain language, where immediate action was required. By combining the intercepted messages and Direction Finding (D/F) bearings on the transmissions made by the "Y" service with radar information, a fairly complete picture emerged of the size of the formation, area of operation and bases used by the enemy aircraft. W/T intercept was not necessary on FDTs, since the information was usually only of longer term strategic value. However, if required, the information could be made available to seaborne forces by broadcasting it from a static "Y" station. Unlike the main HQ ships, the Assault HQ ships were in touch with troops ashore. The troops provided information on targets and reported back on the effectiveness of shelling for the benefit of the warships' gunners. The Assault HQ ships could also direct minor craft and amphibian vehicles working between the carrier ships, transports and the shore. The HQ ships also had links, through their air force personnel, to the crews of fighter bombers and rocket firing aircraft. In turn, they could be put in direct radio contact with forward platoons and other junior commanders when specific strikes were needed in support of advancing infantry and tanks. As the invasion developed, the Assault HQ ships produced a stream of directives for changes to the overall plan. For example, 'Bombarding' warships were given new targets, reserve brigades in some cases were brought ashore more quickly than planned and a host of minor changes including the provision of hot food to landing craft crews and the replacement of lost equipment. HMS Bulolo handled around 2,300 messages per day as they fine-tuned the grand plan in the light of experience - rough weather, bottlenecks on beaches caused by obstacles or enemy action, landings in the wrong places due to navigational errors, breakdowns etc. Where the landings were delayed or repositioned, it was vital that gunners, acting in support of the advancing troops, were well aware of the changes to adjust the timing and targeting of their bombardments. Whatever eventuality arose, the Assault HQ ships were expected to have an alternative course ready to follow and to advise all interested parties, including the Admiralty. A variety of vessels were used, including Cruisers, Gunboats, Frigates, Destroyers, Converted Passenger Vessels, Yachts and Landing Craft. They were assigned to the Initial Assault Fleet to serve as Flagships, Landing Ship HQ (LSH) and Control Vessels. Try Google for more information on specific vessels. HQ Ship - Force G3 (Ferry Control) As part of LSH Force G3 she departed from the Solent on 5 June, arriving off Gold beach on D-Day in Assault Convoy G16B. From 8 June, her convoy duties completed, she became an HQ Ship for the monitoring and control of 'ferry craft', which plied the water between southern England and the Normandy coast. [14,200T/1939] Cargo/Passenger ship of Panama Line US HQ - Force O Left Plymouth via the Rutland harbour anchorage on 5 June, arriving off Omaha at 02.51 on D-Day in Assault Convoy 01. US Flag Ship - Force O, Naval Commander, Western Task Force and Bombardment Force Reserve Ship Left Plymouth Sound Anchorage on 5 June arriving off Omaha on D-Day in Assault Convoy O1A. Returned 25 June. [8100T/1943] US Attack Transport (Troop Carrier) HQ Ship - Force U Left Plymouth Sound anchorage at 09.43 on 5 June, and arrived off Utah at 02.29 as part of assault convoy U1A. Returned 25 June. Liner of the Australian Burns Philp line HQ Ship - Force G As HMLSH Force G she left Southampton at 17.10 and the Solent at 18.37 on 5 June, arriving off Gold beach at 05.56 on D-Day as part of Assault convoy G9A. She sustained bomb damage near the Operations Room at 06.05 on 7 June and superficial damage to her upper structure when rammed by the Empire Pitt on 15 June. Also hit by an LCT at 10.10 on 27 June. Returned to Southampton at 12.12 on 28 June. HMS Dacres US Frigate HQ Ship - Force S2 Left Portsmouth harbour 5 June. After embarkation off Newhaven, left 12.15, arriving Sword 6 June in Assault Convoy S10. Assisted in the salvage of James A Farrell on 29 June. After embarkation from dockside left Portsmouth harbour at 13.20 on 5 June arriving Sword on 6 June in Assault Convoy S5. Damaged by mine 24 July. 7,403T/1931 Liner HQ Ship - Force J. Flagship Eastern Task Force from 24 June. After embarkation at Southampton by tender, left Spithead Gate 19.25 on 5 June, arriving Juno 05.58 on 6 June in Assault Convoy J11. Suffered slight damage from a "near miss" bomb at 04.10 on 13 June. HMS Kingsmill US Frigate HQ Ship - Force G2. Ferry Control 19 June to 30th. Embarkation at Southampton . Left Solent, arriving Gold 6 June as part of Assault Convoy G10A. 4,504T/1938 French Merchant Vessel CHARLES PLUMIER later French/Vichy French Armed Merchant Cruiser (Captured by RN off Gibraltar). HQ Ship - Force S From Portsmouth Harbour jetty left Solent 21.45 on 5 June, arriving Sword 6 June in Assault Convoy S7. Slightly damaged by mine at 00.45 on 25 June and by gunfire at 18.30 on 28th. Returned to Solent on 30 June when Sword beachhead was closed. 1943 US Frigate Temp LS HQ Ship - Force J1 Embarkation at Southampton. Left Solent 5 June, arriving Juno 6 June, in Assault Convoy J9. On 8 June broke in two following air attack with the loss of 21 crew members and unknown Army personnel. Gunboat Temp LS HQ Ship - Force S1 Left Portsmouth Harbour Jetty and Spithead Gate at 19.35 on 5 June, arriving Sword 6 June in Assault Convoy S12. Damaged by gunfire 16 June (Approx). [8036T/1938] Ellerman Liner City of Edinburgh Reserve LS HQ Left River Forth 6 June, arriving Harwich on 8th. Frigate Temp HQ Ship - Force G1 Embarked Southampton, left Solent 5 June, arriving Gold 6 June in Assault Convoy G9C. Damaged by bomb at 23.21 on 24 June. LS HQ Ship - Force J3. Embarked at Southampton. Left Solent 16.00 5 June, arriving Juno 08.08 on 6 June in Assault Convoy J14. Carried 6 Landing Craft on outward trip. On 26 June became HQ Ship for Captain (north & southbound convoys). [387T/ 1927] Yacht HQ Ship - Force S. Special Service (Ferry Control) Left Portsmouth Harbour 5 Jun arrived Sword 6 June in Assault Convoy S5. On June 6 rescued survivors from Svenner. HMS Scylla Cruiser Flagship Naval Commander Eastern Task Force Left Portsmouth harbour 13.40 and Solent at 16.27 on 5 June. Arriving Sword 04.15 on 6 June. Damaged by mine 22.56 on 23 June while moving from Juno to Sword. Towed by tugs Envoy & Thames to Solent. Not repaired. Frigate HQ Ship - Force J2. (Ferry Control) Embarked Southampton. Left Solent 5 June, arriving Juno 6 June in Assault Convoy J10. - 9 Landing Craft Landing Craft Control (LCC) During the course of D-Day the following craft were assigned; 10,20,30,40,50,60,70,80. & 90. - 11 Landing Craft Landing Craft HQ (LCH) During the course of D-Day the following craft were assigned; 98, 100, 167, 168, 185, 187, 239, 245, 269, 275 & 317. Depot Accommodation Control (Over Assault) Headquarters + Repair Ships, Craft & Barges, Dredgers, Fireboats, Lightships and Kitchen Barges. These were the Naval and Merchant ships allocated to stationary tasks off the Normandy coast and UK waters (Neptune duties). Try Google for more information on specific vessels. 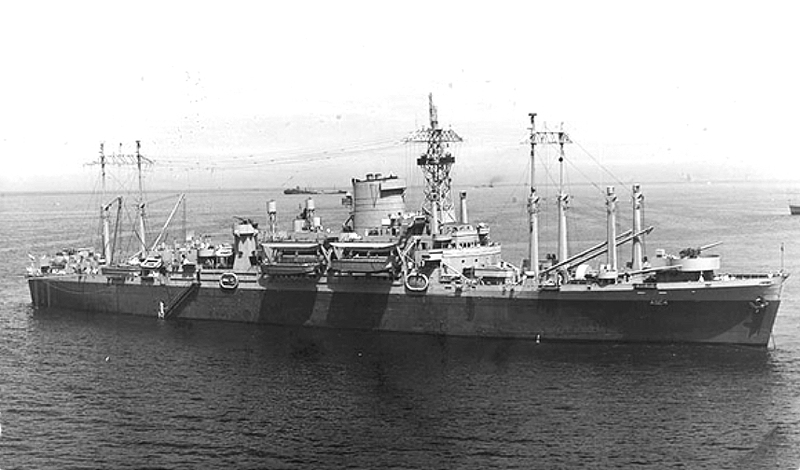 USS Adonis US LST Repair ship for landing craft. Departed Plymouth, via Weymouth Bay anchorage, arrived Omaha at 12.24 on 8 June for service at Mulberry A. Achelous Class Landing Craft Repair Ship: Laid down as LST-83. Reclassified and renamed USS Adonis. HMS Adventure HM Minelayer Repair ship. Left Solent anchorage on 7 June, arrived Gold at 08.30 on the 8th in Convoy EWP 1 for service on Mulberry B. On 30th anchored inside Mulberry B.
 HM Seaplane Carrier [Ex Australian Navy] Repair ship. Left Thames at 06.00 on 7 June, arrived Sword on 8th in Convoy ETM 2 for service at Gooseberry 5. Damaged by gunfire on the 23rd and 26th. Moved to Gold on the 29th. [1,849T/ 1913] Belgian Cross Channel Car Ferry HM Minesweeper Left Solent anchorage 13.30 on 9 June, arrived in assigned anchorage in Eastern Task Force Area on the 12th. [17,491T/ 1924] New Zealand Liner Depot ship for tugs. Left Liverpool 29 April, arrived Solent anchorage 5 May. Replaced by Empress of Russia in July. [544 Tonne 1935] Clyde Passenger Vessel (Paddle Steamer) HM HQ Ship (Mulberry B) Left Solent anchorage, arrived Gold 08.30 on the 7th in Convoy EWC 1B. [10,048T/ 1910] Passenger/Cargo Vessel Depot Ship Left Thames 06.00 on 7 June, arrived Juno 10.22 on 8 June in Convoy ETM 2 for service at Gooseberry 4. USS Atlas US LST Repair Ship for Landing Craft Ex Falmouth. Left Plymouth 7 June. Arrived Utah for service on Gooseberry 1. [4,890T/1937] HMLST (1) Tank & Truck Ferry then Rhino Depot Ship. Loaded Tilbury, London and left for Eastern Task Force Area. Carrying capacity 18 tanks or 33 trucks and 207 troops. After unloading cargo became Rhino Depot Ship on 8 June. Damaged by gunfire on the 14th and by mine on the 23rd. Returned UK on 28th. Sometimes referred to as Bachachero. Had the distinction of being the first ever Tank Landing Ship. Ex Trawler HM Depot Trawler Left Solent arrived Omaha 11 June, in Convoy EBC5W. [7,191T/1942] US Liberty Ship Depot Ship Left Barry and Bristol Channel 5 June at 11.30. Arrived Western Task Force Area 08.00 on the 11th in Convoy EBM 2. [679T/1930] Southampton/IOW Ferry Landing Craft Engineering and Maintenance In Solent in support of Force J (Juno). [8,009T/1923] French Passenger Vessel Depot Ship. Left Thames 06.00 on 7 June, arrived Sword 8th in Convoy ETM 2 for service on Gooseberry 5. Damaged by gunfire on 22nd & 25th. Moved to Gold on 29th. HMS Capetown HM Cruiser Depot Ship Ex Falmouth via Weymouth Bay to Omaha at 08.30 on 7 June in Convoy EBP 1 for service on Mulberry A.
HMS Ceres HM Cruiser Depot Ship Ex Falmouth via Weymouth Bay, arrived Utah 08.30 on 7 June in Convoy EBP 1 for service on Gooseberry 1. USS Chimo US Auxiliary Minelayer Minesweeper Depot Ship Left Plymouth 09.00 on 6 June. Arrived Utah 08.00 on 7th in Convoy EBM 2. HM Cruiser Depot Ship Normandy 12 June to 15 Aug. To Polish Navy 4 Oct 44. HMS Despatch HM Cruiser HQ Base & AA Defence Ship Left Solent 23.10 on 7 June. Arrived Gold 09.30 on 8 June in Convoy EWP 1. Dredgers Dredgers Dredgers The following dredgers were deployed: Dm Dredge No 16; From Foulney H+B Ry Dredger No 4 and James Nos 4, 32, 36, 46 & 67; From Ramsgate, Red No 6, Rossall, TB, Taylor, TCC Hopper No 1, TIC Nos 18 & 19 and Tolverne. [7,191T/1942] US Liberty Type Accommodation Ship Left Barry 5 June & Bristol Channel at 11.30, arrived Omaha 08.00 on 7 June in Convoy EBM 2 for service at Mulberry A.
Fireboats Fireboats Fireboats DEW (?) for Gold Beach, MH Stephen left Solent 19.00 on 5 June for Juno in Assault Convoy J15. [757T/1925] Southern Rail Vessel Bombardon Control Ship later Accommodation Ship Left Weymouth Bay 4 June for Selsey, arrived Gold 7 June in Follow Up Convoy LS/ETM 1.. Returned to Portland 21 June, later to serve as Normandy Accommodation ship. Sunk 18 Aug with loss of 31 crew members. Cruiser Training & Depot Ship After Bombardment task was Depot Ship at Mulberry B. Torpedoed off Courseilles 9 Aug. Returned to UK 15 Aug.
George D Irvine Trawler (?) HM Depot Trawler Initially at Solent arrived Sword 23 Jun. [7,176T/1943] US Liberty Type Depot Ship Left Cardiff 5 June via Solent, arrived Gold 8 June in Convoy EBM 3 for service to Personnel Manning US Landing Craft. [756T/1925] Southern Railway Vessel HM Mulberry Control & Receiving Ship Arrived Gold 7 June in Follow Up Convoy L5/ETM1. Receiving ship at Mulberry B for Bombardons, Phoenix and Whales. Also Plankers and Sappers HQ. Ex Cruiser Training Ship Spare Depot Ship June 1944, Western Task Force Gunfire Support Bombardment Force A for Utah Beach. Passenger Vessel Control Ship Ferry Control HQ Ship for Force J. In late summer of 1944 reverted to cross channel trooping. [11,106T/1921] Ferry in Singapore Straits Depot & Repair Ship For Minesweepers and Anti Submarine Trawlers anchored in Solent. [617T/1896] Excursion Vessel Accommodation Ship (?) Mulberry Whale Sections. Lightships Lightships Lightships Juno and Kansas ex Thames positioned 18 June. LSE 1 US LST Landing Ship Emergency Repair (LSE) In reserve at Plymouth. On 23 June sailed from Solent for service in Eastern Task Force Area. LSE 2 US LST Landing Ship Emergency Repair Ex Solent for Juno. USS Melville US Destroyer Tender Landing Craft Emergency Repair Ex Weymouth, arrived Juno 12 June. Beginning in May 1944 she helped minesweepers and landing craft as they got ready for the June invasion of Normandy. For the next year she was busy maintaining and repairing landing craft for the Allied push toward Germany. USS Miantonomah US Minelayer Task Force HQ Ship Western Task Force area 25 June in Convoy ECP15. Embarked Rear Admiral John Wilkes and became flagship for CTF 125. She steamed to Cherbourg 9 July and on the 18th, Admiral Wilkes hauled down his flag prior to Miantonomah's departure to England to carry supplies for port clearance operations. Sunk 25/9 with the loss of 58 crew. Landing Craft Rhino Depot Ship British Assault Area, Mulberry B Rhino. US Lend/Lease Vessel Accommodation Ship Western Task Force Area 8th June in Convoy EBC2Y. [4,273T/1928] US Vessel US Accommodation Ship Ordered to leave Bristol Channel 23 Jun for service at Omaha in July. [798T/1916] New Medway Excursion Vessel Accommodation & Despatch Control Ship Mulberry Accommodation & Despatch Control Ship at Peel Bank, Isle of Wight from 3 to 15 June then Dungeness. [798T/1916] New Medway Excursion Vessel (Paddle Steamer) Despatch & Control Ship Mulberry Despatch Control at Selsey then Peel Bank, Isle of Wight from 24 June. Built as the minesweeper HMS Melton for the Royal Navy in the Great War and later converted for passenger use. Paddle Steamer Accommodation Ship Mulberry Control Ship. [483T/1896] Excursion Vessel HQ Ship Left Dungeness on 14 June for Peel Bank, Isle of Wight for service until 24 June. [10,917T/1929] Auxiliary Minelayer Accommodation/Temp HQ Ship Left Solent 23.05 on 7 June, arrived Juno 8th in Convoy EWP1. After October 1944, she was used as accommodation ship and ended the war as a fleet training ship in the Pacific. 1945 returned to owner. American Lend/Lease Accommodation Ship Western Task Force.
 ? HM Trawler Depot Ship Left Solent, arrived Utah 24 June in Convoy ECB17W. Minesweeper Maintenance Ship HQ Ship ? Landing Ship Tank Depot Ship Rhino Depot Ship from 8 June. Grounded in gale 19 June. [7,176T/1942] US Liberty Type Accommodation Ship Left Barry 5 June via Solent arrived Utah 8th in Convoy EBM3 for service at Gooseberry 1. [7,176T/1942] US Liberty Type Depot Ship Left Clyde 13 June via Milford Haven arrived Utah 1 July, in Convoy ECN19P. [8,351T/1922] Belgian Vessel Depot Ship Left Thames 06.00 on 7 June, arrived Gold at 12.00 on 8 June in Convoy ETM2 for service at Mulberry B .
Tyne ? Depot Ship For fleet Destroyers and Escorts. Left Scapa Flow 07.42 on 1 June, arrived Solent 09.00 June 5. 1915 Trawler? HM Depot Trawler ? Landing Craft Landing Craft Landing Barge Emergency Repair 1-10 & 12-60. Landing Craft Landing Craft Landing Barge Kitchen 1-10. Landing Craft Landing Craft Landing Craft Emergency Repair 13, 15, 16, 19, 23, 24. 1 FDTs influence on the role of HQ Ships With the introduction of the Fighter Direction Tenders (FDTs), the usefulness of the HQ ships, from the RAF point of view, was diminished. A reduction in personnel and equipment was recommended. However, they did provide useful visual information on low flying enemy aircraft to the FDTs and thereby to the low cover fighter aircraft of the Allies. This resulted in the interception and destruction of three enemy aircraft. The air situation plot required by the Commodore of each Assault Force could be adequately provided by information from the FDTs, whose radar was superior and who had access to the same information sources as the HQ ships. It was suggested that the filter room on the HQ ships and their personnel could be "eliminated". Since the HQ ships would most likely never take over control of the Fighter cover from the FDTs, it was suggested that "controlling personnel" be removed from the HQ ships or substantially reduced to two Controllers and two Deputy Controllers. In view of the superior radar and comprehensive communications equipment, it was recommended that the FDTs should initiate Air Raid Warnings with the HQ ships giving warnings in their own assault areas. Two separate channels of communications between the HQ ships and FDTs were essential 24/7, one for plotting and the other for liaison. 2 Diverting Fighters from pre determined missions. Fighters engaged on direct support were given specific targets before take off. En route, they were instructed to radio the HQ ship in the area they were over-flying, to enable the Air Staff Officer, or Controller, on board to divert them to targets of opportunity. However, in the event there were few occasions when aircraft were available and, even when they were, the Army staff had no clear picture of battleground conditions to allow them to identify suitable targets. 3 Ensuring appropriate high level Army Representation on HQ Ships An Army officer of sufficient rank should remain on board each HQ ship to represent the views of the Divisional Commander until the ship ceases to act as forward control of the Fighter/Bomber forces. The absence of the Military Commander, and all his senior staff who had gone ashore after H+6, contributed to the ineffectiveness of this part of the operation. The remaining Army personnel had insufficient rank and experience to represent the Army point of view. In future operations involving heavy Air Support for the Army it was recommended that the Army should have adequate representation on board the HQ ship until they had handed over control to shore based establishments. 4 Intelligence Gathering It was strongly recommended that a full "Y" team be onboard the HQ ships. 5 Training and Familiarisation The HQ ships should arrive in the assault area three months prior to an action to allow time to train many hundreds of people, from different disciplines and geographical locations, to be trained in their own jobs and to have an understanding of the roles of others they are likely to deal with. 6 Preparation Time Officers in charge of the Air Section of HQ ships should be briefed a month in advance of the action to allow time for them to select maps they require and to make preparations that cannot satisfactorily be left to the last minute. 7 Knowledge Update RAF personnel with 18 months continuous service on ships should be given the option of transfer to land stations to update their knowledge. 8 Naval Assault Radar The Naval Assault radar reporting had little value without a Movement Section to identify the tracks. 9 Ceiling on Personnel Numbers A pre-determined limit on the number of Army and RAF personnel should be set and adhered to. Many last minute additions were embarked causing overcrowding, discomfort and the risk of heavy casualties in the event of damage or sinking. 10 HQ Standby Ships During the Normandy landings there were three vessels on standby as HQ ships; HMS Allbrighton, HMS Royal Ulsterman and HMS Dacres. They were never called upon to undertake the duties and, in hindsight, the Allbrighton and the Dacres were judged to be too small for the task. If they were considered necessary, they should be large enough to accommodate 25 RAF personnel with equipment to receive the FDT plotting wave, the FDT liaison wave, the Air Command wave, the Air Base wave and the three Aircraft waves. 11 Approaching Allied Aircraft Alerts To reduce the risk of Allied aircraft being shot down by friendly fire an enlarged Movement Liaison Section had been established in No 11 Group Filter Room at Stanmore. They transmitted by wireless telegraphy coded messages to HQ ships, FDTs and Operations Rooms on the far shore (as opposed to the home shore). When the aircraft were 10 minutes flying time from the beaches, one HQ ship broadcast warnings of the approach of friendly aircraft on the Joint Forces frequency. This was particularly effective in the case of low flying aircraft but only when the messages were received and acted upon by all ships. 12 Spotter Plane In an area thought to have little significance, the HQ ships performed an important role. Spotter planes working with bombardment ships (reporting on targets and the accuracy of shell-fire) were, in many cases, unable to speak directly to the ships concerned. In these circumstances, the pilots were advised to radio the nearest HQ ship for instructions. The HQ ships provided a communication link to the bombarding ships or otherwise returned them to base with their missions unfulfilled. At times there were too many spotter craft over the anchorage area and it was difficult to co-ordinate their deployment to the bombarding ships available. 1) Mountbatten. The Official Biography by P Ziegler. 2) The Watery Maze by Bernard Fergusson. 3) Combined Operations 1940 - 1942. HMSO booklet. 4) The Greatest Air Battle by Norman Franks. 5) Shore Establishments of the Royal Navy by Lt Cdr B Wardlow RN. 6) PRO-WO244/12; The Role and Operation of HQ Ships During the Assault on the Continent of Europe. 7)The Largs Association (Mike MacKenzie). 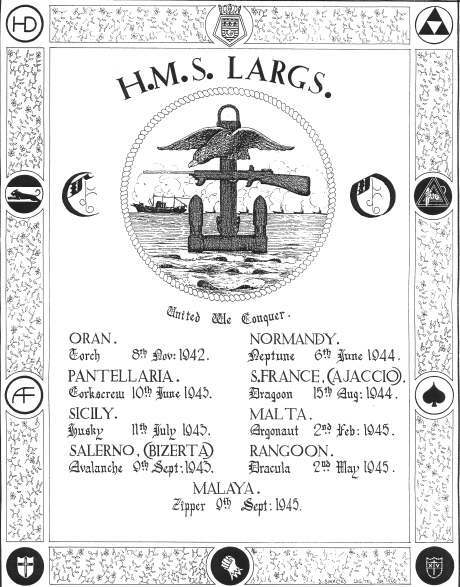 8) The late Sid Windebank, LAC RAF on HMS Largs. 9) Mr Fred Earney, LAC RAF on HMS Largs. 10) Mr Jim Rolt, brother of Tommie Rolt Ex HMS Largs, KIA when FDT 216 sank. If you have any information about or photos of WW2 HQ Ships please contact us. Any material, no matter how small could be of interest.